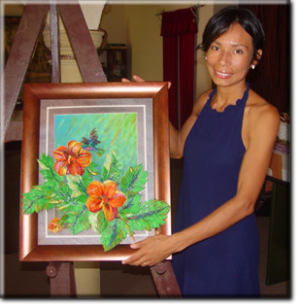 Costa Rican artist Tatiana Montano Romero has been fascinated with art since childhood. In her youth she painted and illustrated scenes as she traveled with her parents throughout Central America. Without realizing it at such an early age, she reflects now that these travels afforded her the opportunity to acquire much knowledge of art and to experience the various traditions of different indigenous cultures. With multidiscipline studies of design, tailoring and couture, for many years Tatiana dedicated her passion to fashion design. However, the wife of a French artist and mother of four never abandoned her own dreams to capture her experiences on canvas.